One quarter of one percent (.25%) of computer scientists are black. Below we link to profiles of "all" Black Computer Scientists. The Computer Scientists below occupy a broad range, from essentially mathematicians to essentially engineers. Adekunle O. Adeyeye - Technology Review: one of the top 100 innovators under age 35 "whose work and ideas will change the world." Nathaniel Dean: crosses back and forth between Computer Sciences and Mathematics. Publications in both. Philip Emeagwali: 1988 winner of the Gordon Prize for super-computing skills. David Hedgley father of 3D graphics? Oliver Chukwudi Ibe: author of 6 books on ATM technology, and articles on queueing. 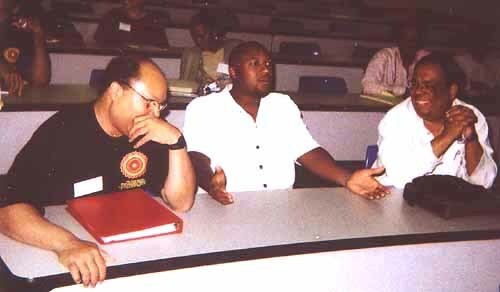 Yves Jean - first Black research computer scientist at Lucent Technologies who "make things better"
Ojelankik Ngwenyama: in 1997 got MISQ Best Paper Rod Moten: from hoodlum in the streets to recent Cornell doctorate. Mark A. Smith: first MIT CS Ph.D.